A wonderful cake topped with many animals was served at coffee hour to honor Fr. Darrell on his last Sunday as interim for Holy Cross. Dr. Darrell has worked extensively with Heifer International. A representative with Heifer had given a presentation during the Adult Forum earlier that morning, hence the farm animals! The Rev. Darrell Huddleston presided and preached his last Sunday in an interim capacity on November 20. Fr. Darrell, a current resident of Concord who retired in 2007 from full-time ministry, currently assists on occasion at St. Paul’s in Concord. Before coming to Holy Cross for a time during our vicar search, Fr. Darrell had completed an interim assignment at Grace Church in Manchester. Over the years, he has served a variety of congregations as well as the regional director of Heifer Project International. He and his wife Bunny have lived, worked or traveled extensively in 27 countries. Bishop Arthur Walmsley, a parishioner at Holy Cross, and Fr. 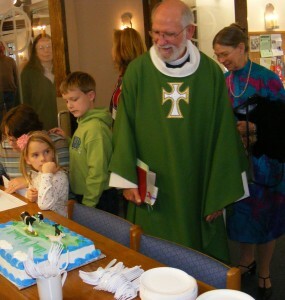 Darrell have been sharing interim duties at Holy Cross during the summer and fall as the vicar search continued. The vestry recently called Lise Hildebrandt to be our new vicar and she will officially begin December 1. We will miss Fr. 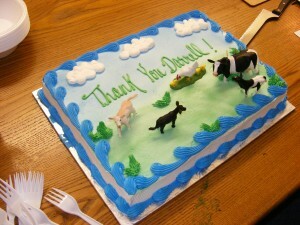 Darrell but wish him well on his continued life’s endeavors.